Who else has a bright orange couch at their house? Just me? We recently did some furniture rearranging at our house. The orange couch had been in our front room, but it’s really more of a love-seat than a couch and there just wasn’t enough seating. So we acquired a new couch for that room and moved the orange couch to our homeschool room/office. It’s a really nice addition and gives Oldest Twin a new place to sit and read his books. There is a shelf that hangs above the orange couch and it’s filled with a variety of decor and storage. But after moving the orange couch into the room I thought it would be fun to add a matching pop of color to the shelf. Handily I already had this white picture frame sitting on that shelf. 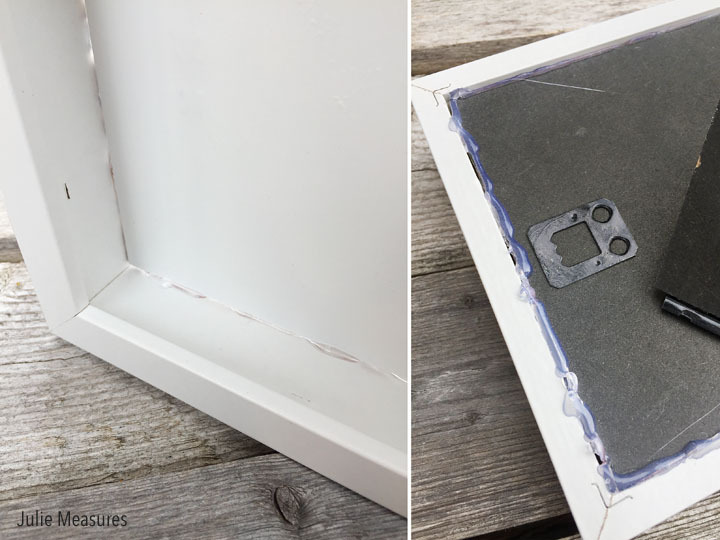 My husband picked the frame up a few weeks ago because he needed the glass from the frame for something for his 3D printer, leaving the actual frame behind. And that worked out perfectly since I didn’t need the glass for my project. 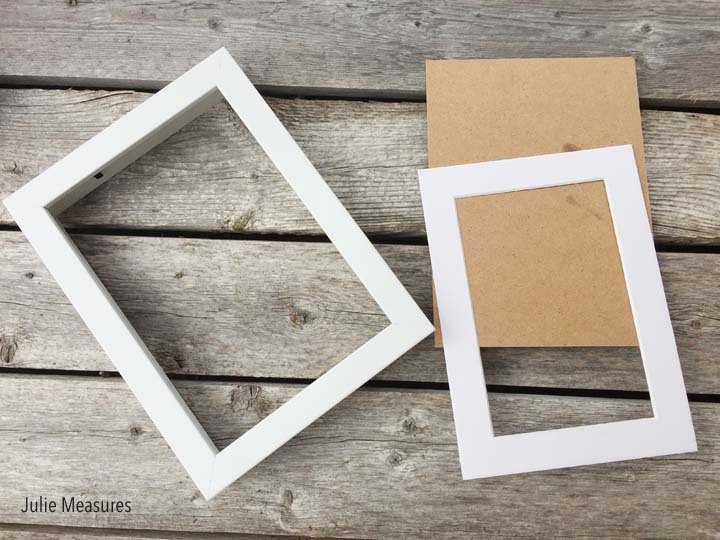 I used a white picture frame and the cardboard backing. I considered using the mat that came with the frame, but ultimately decided not to. Essentially I turned my photo frame into a shadowbox. My first step was to spray paint the back piece of the frame that would be where I planned to mount by knit i-cord piece. 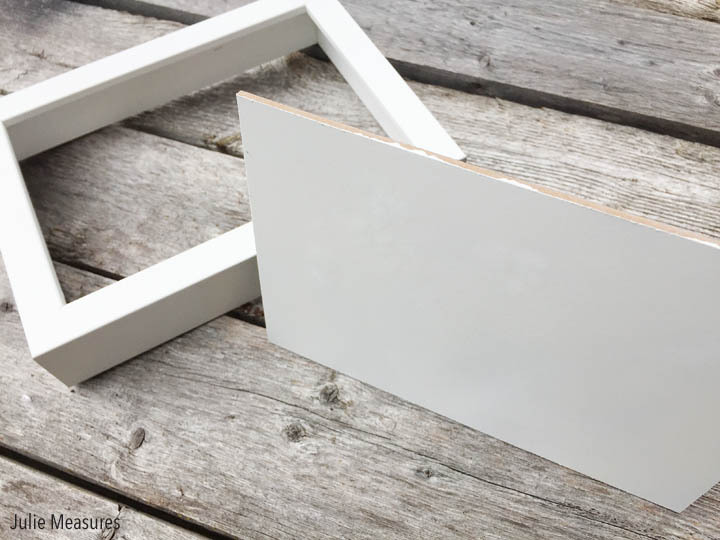 I spray painted it white to match the frame. Once the back piece was dry I used hot glue to attach it to the very back of the frame. I placed a strip of hot glue along one side of the frame and put in the back piece. Then I hot glued around the backing piece on the back side of the frame. 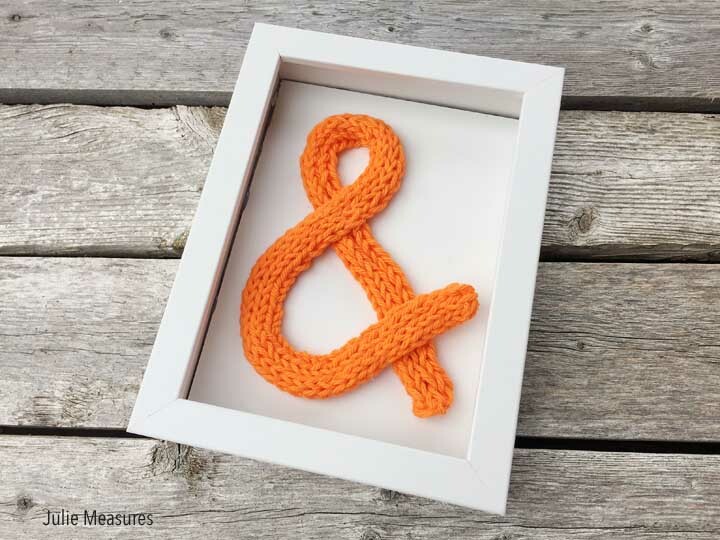 While that was drying and curing I stitched up my ampersand. 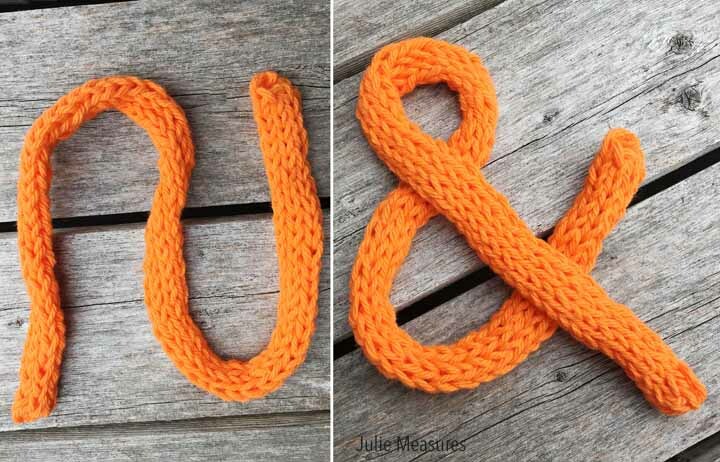 This was made by knitting a piece of i-cord. I used the paper insert from the frame to check my progress and see how big to make the finished piece. When your i-cord is long enough bind off and weave in the ends. 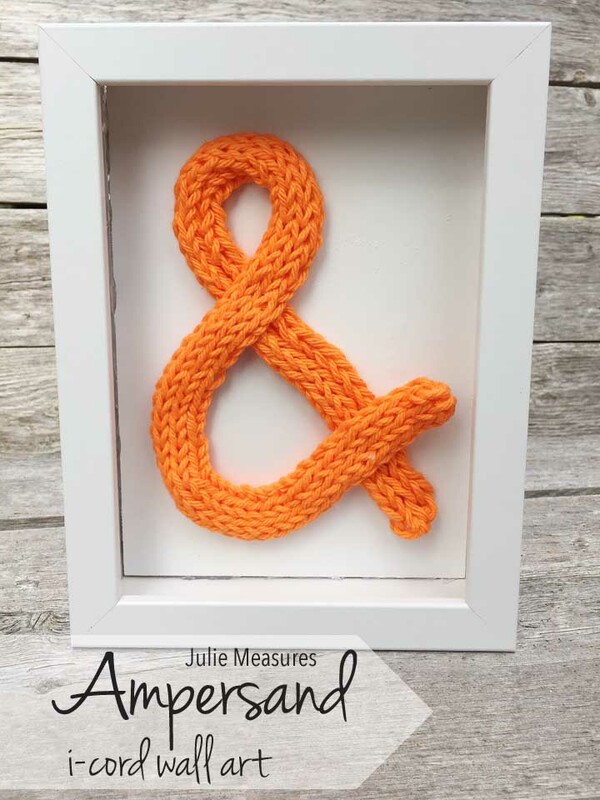 While I chose to make an ampersand you could make this a monogram, a heart, or any other shape you desire. Once the i-cord piece was long enough I attached it to the back piece of my frame. I used some dots of hot glue to secure the i-cord. And just like that I had turned some i-cord into a piece of home decor that is now sitting on my shelf. 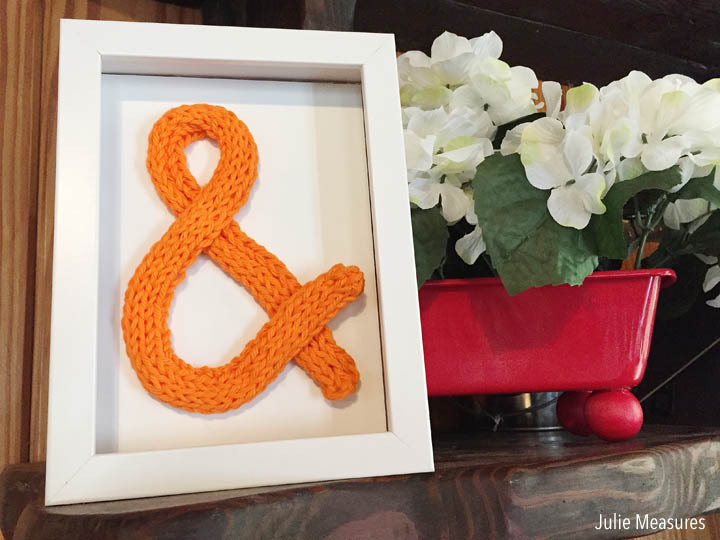 Watch my video where I demonstrate three different ways to make i-cord: knitting, spool, and even crochet! Join our mailing list to receive updates in your inbox.